Sitting just a few feet away from ring action where some of the country's brightest hopes in boxing were fighting for fame and glory, a dejected-looking Manny Pacquiao sat silently and gazing blankly at the squared circle as if his thoughts were miles away from the action. "Ha! ?," Pacquiao was a bit surprised as if awakened from stupor when I told him that AJ Banal, who had just disposed his Thai opponent in the first round, could be the next Manny Pacquiao. "Is it?," Pacquiao blankly replied in the vernacular. That was the ringside scene Saturday night during Cebu's greatest boxing extravaganza dubbed as 'The Moment of Truth'. The title was in reference to Z Gorres, who is known as 'The Dream', to finally make the moment become a reality in his quest for a world title but instead turned out to be a nightmare when two judges and a referee denied him of a sure world championship belt. But the title may have more aptly applied to Manny Pacquiao, the Filipino boxing hero adored by millions of fans around the world. Pacquiao gets mobbed, cheered, praised, admired, exalted, honored and loved wherever he goes -- until Saturday night in Cebu. When, like a slap in the face, Pacquiao got loudly booed by his fans when he, together with Manila mayor Lito Atienza, government lawyer Romulo Macalintal and confidant Wakee Salud, entered the arena. Manny Pacquiao (in striped polo shirt) arrives at the Cebu City Sports Complex together with Manila mayor Lito Atienza and former world champion Dodie Boy Penalosa. Photo by Dong Secuya. 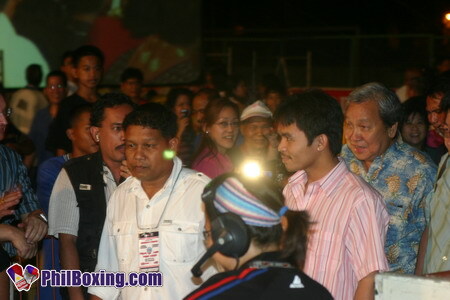 Top photo caption: Manny Pacquiao stares blankly away from the fight while Mayor Atienza follows the action in the ring. Photo by Dong Secuya. For the first time in his boxing career and since he broke into the world boxing scene in November 2003 when he completely demolished the Mexican legend Marco Antonio Barrera, Pacquiao probably felt he was not welcomed and like a dagger thrust into his heart, he got himself thinking what he had done to deserve such a rude reception. You see, Pacquiao gets away with almost anything he does. From bar rumbles to losing large sums of money in the casinos, cockpit arenas and billiard halls, to reports of womanizing, Pacquiao's 'sins' had been readily forgiven and ignored by his adoring fans. Not until when he declared he was running for a political office that the people who had been solidly supporting him got polarized -- and polarized badly. Internet polls from boxing websites, TV surveys and general sentiment of the people whenever Pacquiao's predicament is discussed, vehemently disagree Pacquiao's plan to run for a political office. 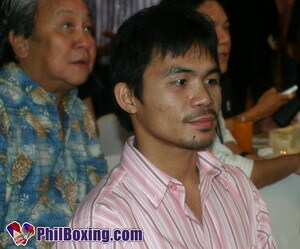 Internet polls voted 9-1 against Pacquiao's political intentions. The Pacland Philippine Boxing Forum on the Internet, virtual home to more than 28,000 registered members from all over the world who closely follow Pacquiao's every move, are full of adverse reactions to Pacquiao's political plan. Before this, almost everyone was proud to be called a Paclander -- a term synonymous to being a Pacquiao fanatic. But after, some have even demanded shutting down the website to protest or use it to actively thwart Pacquiao's plan. And down in Cebu, during the 'Moment of Truth' boxing event where more than 20,000 people came to watch the spectacle, the local Paclanders have refused themselves to be indentified as such, probably feeling a bit ashamed being connected with Pacquiao, when they created a banner supporting the night's featured fighters Z Gorres and Boom Boom Bautista. Thus, the situation came to a head Saturday night when the national icon and boxing hero turned politician, Manny Pacquiao, who may have been quietly despised by many who were in attendance because of his highly unpopular foray into the dirty world of politics, suddenly came into the scene in the middle of the proceedings. The loud booing came, and came in abudance. The truth probably hurts and hurt bad for Manny Pacquiao because he was ill at ease all night -- and that was probably for his own good.